Leslie Smith Gallery will be taking part at the first edition of Art Silicon Valley this October from the 9th to the 12th. This brand new art show promises to be The major art event of the season for the San Francisco area and was set up by the organizers of other famous shows, such as Art Miami. Leslie Smith Gallery will present a range of fine modern and contemporary art at the show. Pablo Picasso was born in Malaga, Spain on October 25, 1881. By the age of 15 he was already technically skilled in drawing and painting. Picasso's highly original style continuously evolved throughout his long career, expanding the definition of what art could be. In addition to painting, he would explore sculpture, ceramics and other art forms, and become one of the most influential artists of the 1900’s. 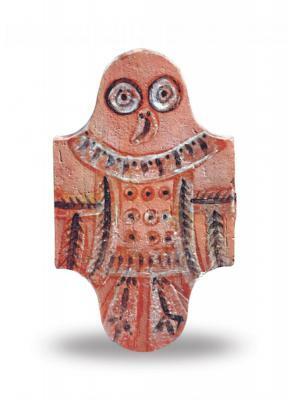 The charming Hibou, where Picasso has used the basic shape of a terracotta floor tile or tomette and decorated it very simply with black and white glaze to create a beautiful owl, was perhaps a reminder of the artist’s owl which lived with him and Francoise Gilot in Paris in the 1940s and 1950s. After enjoying accolades from the public and critics Gavin Rain (South African, b. 1971) participated in the Venice Biennale both in 2011 and in 2013. His work is the produce of a thorough scientific analysis applied to understand the world he lives in and is supported by social sciences, mathematics, and artistic research. Simultaneously, the paintings are visually intriguing, built up from precisely placed, multicoloured circles compelling the viewer to take a step back. It is precisely in this backing-off that the artist’s intended message lies: in order to acquire awareness of something that is concealed yet right in front of your eyes, or hidden in plain sight, you must distance yourself by moving backwards. This is not only true for Rain’s art, but also for any social, political, or cultural context. As a young man Watson lived a semi-nomadic lifestyle with his family, walking thousands of miles from waterhole to waterhole. During this time he learned vital information about where drinking water and various sources of nutrition could be found in one of the continent’s most arid regions. Tommy Watson’s emergence as an artist is almost unique within Australian indigenous art. With a professional career of no more than seven years and no formal training in painting except for that which he initially received at the Irrunytju Community Arts Centre, his work has captured the hearts and minds of collectors all around the world. As one of Australia’s most distinguished Indigenous artists he has paintings in both major Australian and international collections. Today, Tommy Watson still maintains strong links with his traditional lands and sacred sites. He paints ancestral stories from both his mother’s country south west of Warakurna and grandfather’s country. Trough his art Tommy Watson is symbolically passing on very important cultural knowledge from his culture and land. His paintings might be described in abstract expressionist terms as exploiting a virtual 'geography of sensation'. The colors and abstract shapes are stunningly beautiful.